Though home repairs are an inevitable cost of being your own landlord, NerdWallet’s analysis found that homeowners who DIY projects large and small may keep costs from going through the roof. Keeping up with home repairs and improvements can be expensive, time-consuming and a real exercise in stress management, whether you do it yourself or hire a pro. But most homeowners know — or soon discover — that such projects are part of the deal when you trade rent for a mortgage payment. Whether they’re referring to the money they put into the house or the money they hope to one day get out of it, 85% of U.S. homeowners say their home is their biggest investment, according to a new NerdWallet survey of 2,001 U.S. adults, 1,353 of whom are homeowners, conducted online by The Harris Poll. And they’re definitely putting money into it: Nearly $450 billion went to improving American homes between 2015 and 2017, according to U.S. Census Bureau data from the American Housing Survey. Mortgage rates have been rising for two years and lots of homeowners are locked into low rates they don’t want to give up by selling their current home, so they’re fixing up instead of moving up. This, paired with first-time homeowners buying homes in need of renovations — because that’s what’s available — seems to be driving a lot of home improvement spending. Unprepared to cover repair costs. About 3 in 10 (31%) homeowners say they don’t have money set aside for home repairs and improvements — a matter of concern, considering 44% of those who have purchased a home experienced their first unexpected repair within the first year after closing. Lamenting the cost of professional work. 80% of homeowners say professionals charge too much, but 68% say those costs are worth it over having to do it themselves. Gung-ho about DIY. American homeowners DIY’d roughly 43 million home improvement projects between 2015 and 2017, according to census data. Nearly three-fourths (73%) of homeowners say there is a wide variety of resources that contain enough information that they could do all home repairs and improvements themselves, if they wanted to, according to the survey. If sometimes a little too gung-ho. But 35% say home improvement shows have led them astray — influencing them to take on a DIY project that ended badly. Spending far less on DIY projects than professional work. DIY projects account for 38% of all home improvements, but just 18% of all home improvement costs, according to NerdWallet analysis of census data. In the kitchen addition/renovation category, for example, the median project cost for handy homeowners was $22,000 less than for homeowners who hired professionals. Energetic (or savvy) when they’re young. Homeowners under age 35 DIY more than half of all their home repair and improvement projects — a larger share than homeowners in all other age groups. As such, they’re spending less; several hundred less on a typical project, according to census data. Exploring their funding options. According to NerdWallet’s survey, 56% of homeowners said they’d be willing to borrow money, from a lender or family member, for example, to do home repairs or improvements that they knew would increase the value of their home, and one-third (33%) would borrow from their retirement fund for a major home repair or improvement. Optimistic about the effects of their work. 72% of homeowners say spending money to improve a home always increases the value. Americans worked on 113 million home improvement projects from 2015 through 2017, spending $449.5 billion, according to recently released data from the 2017 American Housing Survey, conducted by the U.S. Census. These projects included unexpected repairs such as roof leaks and busted pipes, and upgrades like new security system installations and kitchen renovations. While some of these projects were, no doubt, planned, others likely came as a surprise. Of Americans who have ever purchased a home, 44% say they experienced their first unexpected home repair on their most recently purchased home within the first year of ownership; 12% experienced that surprise repair in the first month, according to NerdWallet’s survey. Costs, pop culture and perhaps overconfidence could be driving DIY culture. Eight in 10 (80%) homeowners say professionals charge too much for labor and materials, according to the current survey. And 73% say there is a wide variety of resources available to them that contain enough information that they could do every single one of their home repair and improvement projects themselves, if they wanted to. DIY projects account for 38% of all home improvement projects, but only 18% of home improvement spending ($81.6 billion), according to census data. Landscaping and bedroom renovations are some of the projects homeowners were most likely to DIY compared with hiring a professional, while roof repair or replacement was the project they were least likely to tackle on their own. And there are substantial differences in project spending for DIY projects. Comparing median expenses for a DIY kitchen renovation, for example, homeowners who wielded the tools themselves typically spent $22,000 less than those who employed a professional, according to NerdWallet analysis of the census data. See the second tab of the chart below for more savings data. But improving your home on your own comes with risks: 43% of homeowners say they’ve messed up a DIY home project on at least one occasion, and 35% say a home improvement show influenced them to take on a DIY project that ended badly. Most homeowners draw the line at serious repairs — 78% say they’d be more likely to try small projects themselves than hire a pro, and just 40% say the same about more complex home improvements such as plumbing and electricity. Furthermore, despite their belief that pros charge too much, 68% of homeowners say the cost of hiring a professional for home improvements is worth it over having to do it themselves. Have some humility when you think about tackling repairs and renovations yourself. If it’s a job you’ve never done before, and it’s hard to undo, think really hard whether you should do it yourself, even with the guidance of YouTube. Homeowners age 34 and younger opt to DIY more often than hire a professional, and their home improvement spending reflects that — median project expenditures among these younger homeowners are the lowest, according to census data. But younger homeowners are also more likely to run into problems they didn’t expect, which may force them into self-service home repairs — 60% of millennials (age 22-37) who have ever purchased a home say they ran into their first unexpected home repair on their most recently purchased home within the first year after closing, according to the survey, compared with 47% of Generation X, 29% of baby boomers and 26% of the silent generation. 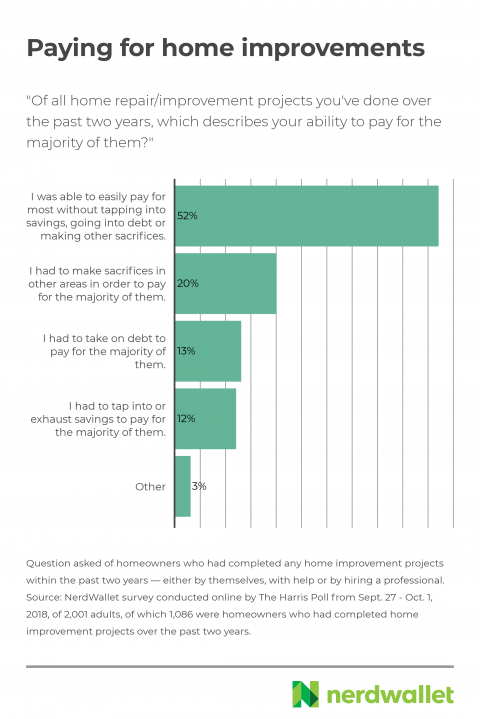 Roughly half (52%) of homeowners who have done a home repair or improvement project over the past two years were easily able to pay for the majority of them, according to the newest NerdWallet survey. As for the others — sacrifices were made, debt was amassed and savings were spent. Homeowners are willing to borrow money to invest in their home’s value; 56% said they’d be willing to borrow money, for example from a lender or family member, to do home repairs or improvements that they knew would increase the value of their home. However, they may not always be aware of which projects fall into that category, as 72% said spending money to improve a home always increases the value. 48% would take out a home equity line of credit (HELOC). 46% would take out a home equity loan. 37% would refinance their home. 33% would borrow money from their retirement fund. How much a project costs certainly goes into these funding decisions. Census data reveal that the highest-dollar home improvement projects are those paid for with homeowners insurance settlements. The cheapest are those paid for with cash from savings. For homeowners facing repair work or dreaming up lofty home improvements, properly estimating the costs in advance can make execution far less stressful. The calculator below is a good place to start, and includes median costs for popular home improvement projects, whether you’re interested in hiring a professional or doing it all yourself. Of course, costs vary by project specifics and location, so be certain to call around for several estimates if you plan to enlist the help of a contractor. This survey was conducted online within the United States by The Harris Poll on behalf of NerdWallet from September 27 – October 1, 2018, among 2,001 U.S. adults ages 18 and older, 1,353 of whom are homeowners. This online survey is not based on a probability sample and therefore no estimate of theoretical sampling error can be calculated. For complete survey methodology, including weighting variables and subgroup sample sizes, please contact Maitri Jani at mjani@nerdwallet.com. NerdWallet defines generations in the following manner: post-millennials, ages 18-21; millennials, ages 22-37; Generation X, ages 38-53; baby boomers, ages 54-72; silent generation, ages 73-90. When a generation is not listed in results, it’s due to a small reporting base and cannot be considered a representative sample. The American Housing Survey is released every two years. For the latest release, interviews took place between June and October 2017 and homeowners were asked about the home improvement projects on their home done “in the past two years.” Respondents could have interpreted that to mean since January 2015, or since mid-2015. The AHS asks homeowners to self-report what they spent on projects in a variety of categories. Beyond defining what constitutes a remodel versus a renovation (as seen below), the survey does not break out projects by scale, scope, quality of materials or finish. AHS data used in this report is specific to owner-occupied households. The AHS measures project expenditures. For the purposes of this analysis, project “costs” and “expenditures” are used interchangeably. It defines remodeling as “a job that made substantial changes to the room. This might include changing the layout of a room, but not tearing down or adding walls.” It excludes “decorating work” such as painting and furnishing. The AHS defines room additions and renovation as major projects that “altered the room by changing its structure,” including adding or removing walls.